It’s almost the end of April, which means Gallery Weekend 2018 is fast approaching. Celebrating its 14th edition this year, Gallery Weekend officially takes place in more than 40 galleries across Berlin, showing work by both new and established artists from April 27th to 29th. Additionally, a host of institutions, galleries, and off-spaces will be opening new exhibitions throughout the week. The choice can be overwhelming so Berlin Art Link has compiled its own list of must-sees during this week’s Gallery Weekend. AA Bronson’s ‘Garten der Lüste’ – a 5-day hybrid installation featuring performances and artworks — will inaugurate KW’s second exhibition season of 2018 as part of its ‘Pause’ series. 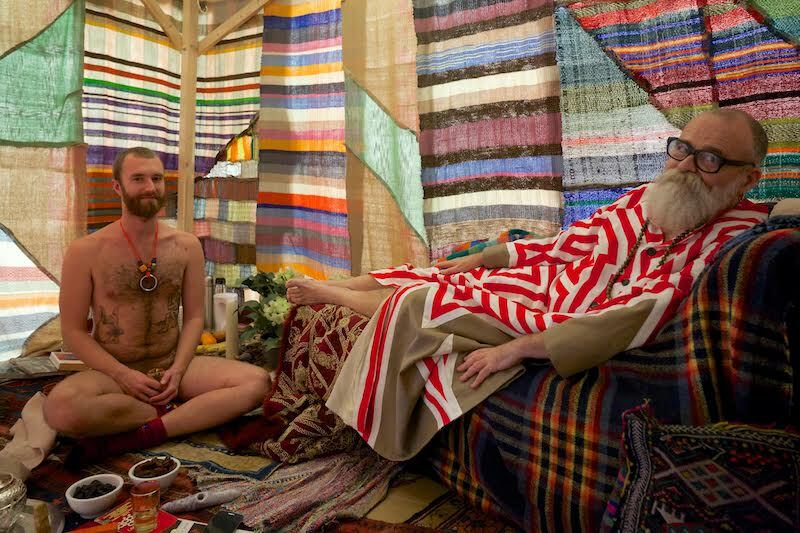 The ‘Tent for Healing’ invites visitors to one-on-one sessions on the subject of healing with the artist. For the second time in its history, the 6000 square meter studio spaces of Lehderstrasse 34 will host a diverse exhibition of paintings, sculpture, multi media, installation, film and photography, in which artists invite other artists to exhibit in the context of the studio environment, thus returning the viewer to the very place of art’s genesis. Ngorongoro is a collapsed volcanic crater in Tanzania. This paradise is also host to the largest concentration of predatory animals in Africa. The principle of this exhibition follows from this opposition. The collision of so many differing artistic identities forms the foundation of the exhibition. In contrast to normativecuratorial practices, the initiators of ‘Ngorongoro’ trust in this phenomenon. Simon Goldin and Jakob Senneby have worked as a duo since 2004, speculating on the layerings of contemporary economics via ideas of the virtual and performance. Opening during Gallery Weekend, their exhibition at Nome is their first solo show in Berlin. ‘Secrets of Trade’ presents key works from Goldin+Senneby’s recent interrogations of financial trading, the art market, and artificial intelligence. Their artworks uncover something of the shrouded relationships between art and money, while also spinning further fictions from them. 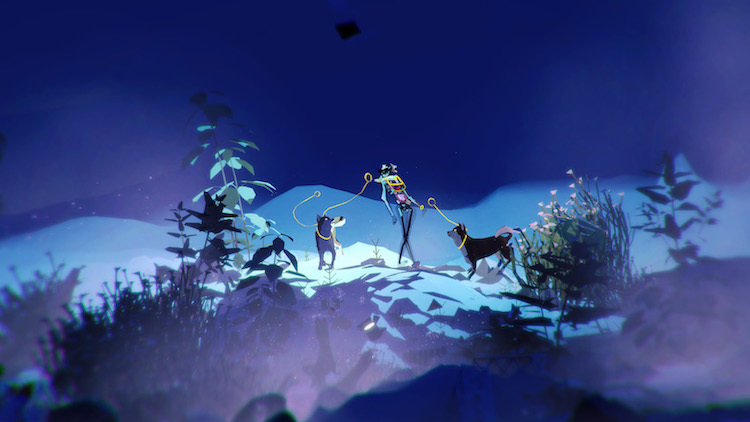 Julia Stoschek Collection presents the complete trilogy of the ‘Emissaries’ (2015–17) by US-american artist Ian Cheng for the first time in Germany. Cheng develops live simulations of endless duration that are based on the principles of video game design, improvisation and the cognitive sciences. In the exhibition, the presentation of the computer-generated simulations is complemented by 56 drawings. As the sketches served the artist as a preparatory storyboard for the live simulations, the exhibition ‘Emissaries’ offers a comprehensive insight into how Cheng’s complex live simulations arise. After a successful debut in May 2016 and second edition last year, Paper Positions Berlin has become known as an exciting independent art fair specifically focused on showcasing contemporary and modern artworks on paper. This year, 46 local and international galleries will come together to present an impressive array of drawings, collages, paper cuttings, text works, photography, art books and objects in an open exhibition format within the centrally located atrium of Deutsche Telekom Hauptstadtrepräsentanz. ‘Floating Utopias’ presents the broad range of pneumatic media in an exhibition and accompanying interventions in urban space. 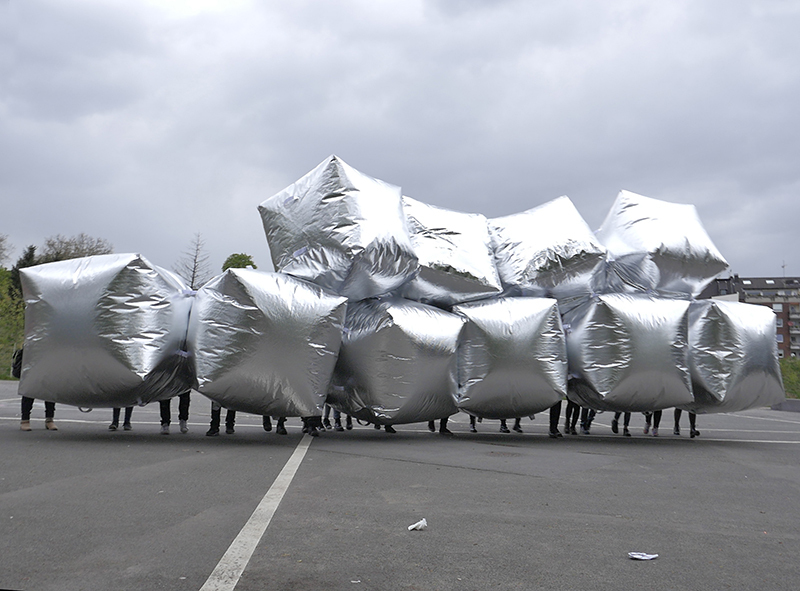 Inflatable objects serve as tools for aesthetic and political interventions: artists and activists situate their works between surreality and functionality, fiction and fact. Inflatables invite us to be playful and disobedient, they forge communities and prompt participation, generate attention and agency. The exhibition includes works by Ant Farm, Artúr van Balen, Theo Botschuijver, Eventstructure Research Group, Anna Hoetjes, Franco Mazzucchelli, Ahmet Öǧüt, Marco Barotti and Plastique Fantastique, Tomás Saraceno, Anika Schwarzlose, Graham Stevens, The Yes Men, Tools for Action, Huw Wal and UFO. Christian Falsnaes‘ ‘Self’ is based on an experiment. The video shows a group that moves together through the city of Berlin and carries out various actions. It is unclear what brought these individuals together, what purpose they pursue, where they go or where they come from. The collective actions are choreographed and run according to exact agreements. The individual bodies become attuned to one another, so that movement, body language, and expression are increasingly synchronized. 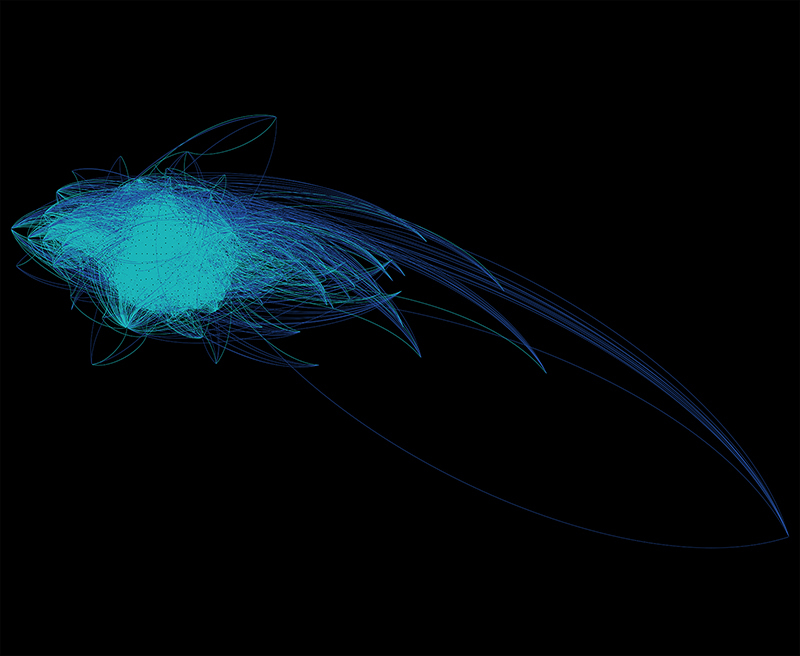 What emerges is a swarm, a mob, a decentered collective body. The 17-minute video ‘Fall Frum Grace, Miss Pipi’s Blue Tale’ (2011) follows the complicated tale of Miss Pipi, a ‘Southern Belle’ with beautifully coiffed hair who has a sexual encounter with a black man, presumably a slave. When their tryst is uncovered, he is eventually beaten, castrated, and brutally killed by a group of white men. The story invokes a cultural fear with origins in the 19th century American South of black men’s sexual power over and violation of white women. As with many of her films, Kara Walker uses the ancient art of shadow puppetry, so that her characters appear as silhouettes against simple, sometimes colorful backgrounds. The use of wood, marble, and bronze have always played an important role in Comte’s practice and for this exhibition she employs them to examine the history of materials as well as the play between ancient and digital technologies. Comte envisioned and is creating an immersive environment with spruce trees, sculptures, and a multi-channel video installation that will consume the nave of König Galerie in an effort to propose connections between the past and present that might help us navigate the anthropocene. Berlin Art Link, in collaboration with Karma Ltd. Extended, invites you to celebrate Gallery Weekend and the opening of ‘Variations on Time’ at ACUD Galerie featuring works by Kapwani Kiwanga and Susanne M. Winterling. Karma Ltd. Extended is a one year collaborative curatorial program at Acud Galerie and aims at a political expansion of the discursive space. Stop by after your gallery opening tour and listen to DJs Marlene Stark, mobilegirl, and GIL, from 10pm until late. In order to question perspectives, concepts, and relationships that are often taken for granted, Eva & Adele have been living together since 1991, creating a common conceptual artwork: when they appear in the international art world, it is always together, dressed the same, always smiling. The artists, according to their own self-definition, come from the future, because with their permanent ‘futuring’ performance, they live a radical shared existence in order to embody their vision for a new definition of gender roles. ‘Eva & Adele – L’amour du risque’ presents the artist-couple’s work over the last 25 years in an installative retrospective. The exhibition explores the concepts underlying the pair’s art and their imagery. 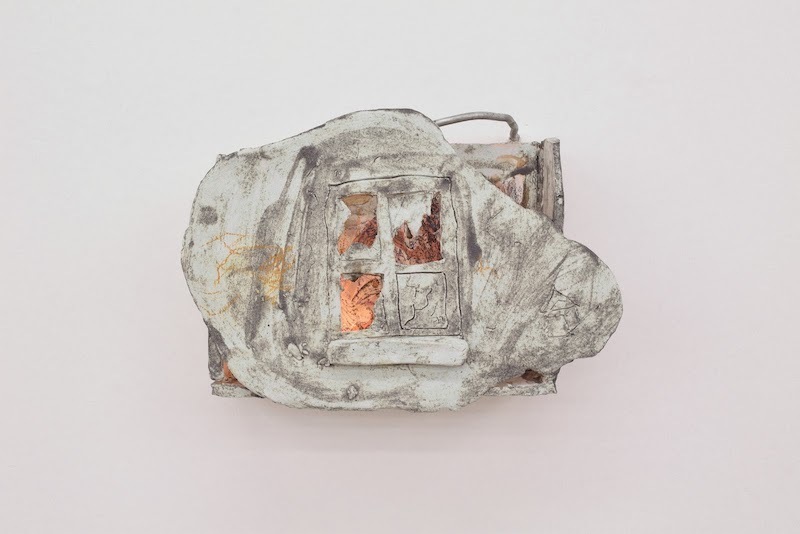 Curated by BAL contributor Penny Rafferty, ‘Haptic House’ at Horseandpony aims to facilitate a radical art-viewing landscape for multi-functional works. Eschewing the traditional gaze manufactured by the white cube, this group exhibition brings together 19 artists to create a show that welcomes viewers into an “emotive subjecthood” beyond the classic viewer-object dichotomy.